Adzuki Bean is an ancient plant, wild forms of the plant originate from and have been grown in Japan for over 6000 years. Unique cultivated varieties of Adzuki Bean were first developed at least 4000 years ago, which is also around the same time that the plant was first spread to mainland China and Korea. 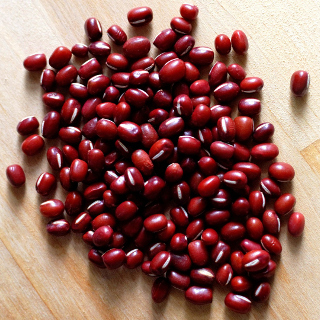 Adzuki Beans are versatile, the beans can be boiled until they're soft and used in both savory and sweet dishes. Like all dried beans, it's a good idea to soak Adzuki Beans overnight to shorten the time it takes to cook them and help leech out any flatulence-causing compounds. Once soft the beans can be further cooked and mashed in a small amount of sweetened water to make red bean paste which is used as a filling for Asian baked goods and for flavouring desserts. The cooked beans are a good source of protein and can be used in curries and stews, add them towards the end of cooking otherwise the beans tend to become mushy and fall apart. Adzuki Beans have a strong nutty flavour and are easier to digest than most other types of dried bean. Adzuki Beans are a nutrient powerhouse, they are a rich source of the Vitamins B1, B5 and B9, as well as the minerals Iron, Magnesium, Phosphorous, Potassium and Zinc. Uncooked Adzuki Beans can be sprouted and taste similar to mung bean sprouts. Adzuki Beans belong to the legume family, legumes form symbiotic relationships with and their roots provide a home for rhizobium bacteria in the soil. These bacteria are able to fix nitrogen from the atmosphere, which the plant takes up and then returns to the soil once it dies. Because of this Adzuki Beans can be grown along the ground as a sprawling cover crop and then dug through the soil to provide nitrogen to aid the growth of crops planted after them. Adzuki Bean requires lots of water during the hotter months of the year so other green manure crops may be more suitable for planting during these times of the year. Adzuki Bean grows as an annual vine that requires trellising to support its growth and make the pods easier to harvest. Adzuki Beans should be grown in a location that receives full sun for best production. Ensure your soil is free draining prior to planting Adzuki Bean seeds, grow Adzuki in raised beds if your soil is compacted or heavy with clay. Dig lots of organic matter including well-rotted animal manures, compost or worm castings through the soil to help improve it's structure, encourage worms and beneficial soil micro-organisms, and provide your young Adzuki vines with the nutrients they need to thrive. Apply rock dust or trace elements if the soil is lacking in mineral content. Adzuki Bean vines should not require additional fertiliser once established. Mulch around Adzuki Beans to retain moisture and reduce competition from annual weeds. Water regularly during the warmer months of the year, at least every second day. Adzuki Bean will grow well on soils with a pH range between 5.5 and 7.5. In temperate regions of Australia sow Adzuki Beans from October to January. In subtropical regions of Australia sow Adzuki Bean seeds from September to February. In the tropics you can sow Adzuki Bean seeds all year round, but remember to keep the watering up when growing during the dry season. Sow Adzuki Bean seeds 3cm deep spacing plants about 10cm apart along a trellis directly where they are to grow. Most Adzuki Bean seedlings will emerge 6 to 18 days after sowing the seeds. Adzuki Bean vines takes between 16 and 18 weeks to begin producing good quantities of beans. Harvest Adzuki Bean pods once they turn fully yellow and allow them to dry out completely in a sheltered location before shelling the beans from the pods.